The headline line in the Sunday St. Louis Post-Dispatch asked "Are St. Louis Area's Home Prices too Low?” This is could not possibly have appeared describing any major metropolitan area of Australia, New Zealand, or the United Kingdom. Nor will newspapers in Vancouver, Toronto, Calgary, Portland, Seattle, Boston, New York or in any of the overpriced markets of California decry low prices any time soon. The March 8, 2015 article by Jim Gallagher rightly noted that house prices tended to be higher in cities outside St. Louis, there are "restrictions on building, either geographical or political." Gallagher quotes William Rogers, an economist at the University of Missouri- St. Louis says that "Developers have really serious problems putting up houses in Los Angeles or San Francisco." Gallagher indicates that "lots of people here could pay more for houses, but they don't have to." That is correct. However, households in St. Louis pay approximately the same percentage of their income to buy houses today that most people have since World War II. That is also the same amount that Angelos and San Franciscans paid until the coming of excessive regulation (see Fischel) in the 1970s; since then house prices there have increased between 2.5 and 3 times. On the surface, St. Louis appears about average in income. St. Louis ranks 25th, slightly above the middle of the 52 major metropolitan areas in per capita income. But that's just the beginning of the story. As anyone looking for employment in other metropolitan areas quickly finds out, housing cost differences can be huge and make up most, if not all the difference in cost of living. When the cost of living is considered, real personal incomes in St. Louis rank ninth among the 52 major metropolitan areas. It may be surprising, but St. Louis ranks above number 10 Seattle. While nominal incomes in Seattle are nearly 20% above that of St. Louis, when the cost of living is considered, St. Louisans had nearly 1% more income than Seattleites in 2012 (Figure). There are some interesting omissions from the top 10. Global city New York ranks 17th, just behind "Music City" Nashville. Portland, America's incubator of house price increasing planning policies, finds itself ranked 39th. Even in Jackson, Mississippi, not large enough to make the over 1,000,000 list, has higher real per capita income than Portland.. Perhaps the biggest surprise is Los Angeles. 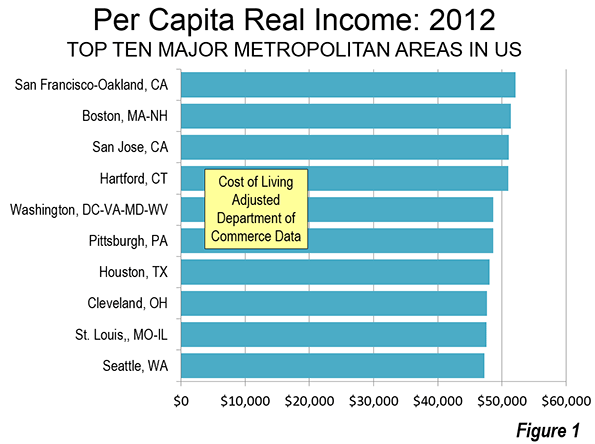 Like New York, often considered a Global City, the city of my birth is anything but Global City real per capita incomes. Even depressed Detroit (though the suburbs of Detroit are anything but depressed) is ranked 10 positions above Los Angeles and has real per capita income 10% higher. Also, with the money they don't have to pay for over-priced housing, St. Louisans can buy more "stuff" or take longer vacations. Nor do St. Louisans get less for their less money. The median sized detached house is the same in St. Louis (1,800 square feet) as in San Francisco and slightly larger than in Los Angeles (1,744 square feet), according to the American Housing Survey in 2012, yet St. Louisans pay much less. Submitted by joclean11 on Mon, 03/30/2015 - 11:15. Submitted by tomswanson on Fri, 03/20/2015 - 02:27. I didn't know much about this place after reading your post I came to know that Life is Good in St. Louis. What I like in St. Louis is not marijuana but, like, real grass. Here it grows naturally, without lots of watering, indicative of a lush climate that produces some gorgeous vistas. Which also leads to great places to go camping; instead of plopping down on hard, sandy earth, you can pitch your tent under actual tree cover so you don't have to absorb the scorching sun. You can read more about this in buy essays reviews[ https://reviews.clazwork.com ] guest blog post. Submitted by davebarnes on Fri, 03/13/2015 - 21:49. Submitted by thomaswillis on Wed, 03/18/2015 - 02:25. I agree that to the fact that staying in St. Louis is really good, this is my personal experience.